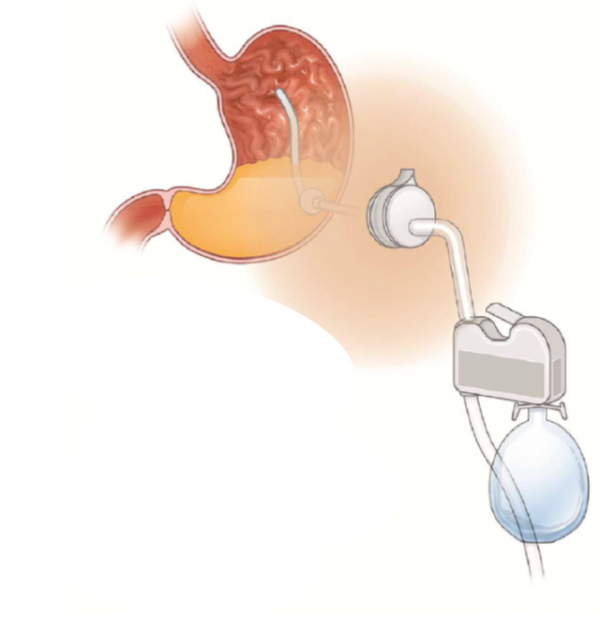 AspireAssist® (AA) is a non-surgical and reversible weight loss procedure that involves having a tube placed through your stomach wall and skin, out to your abdomen for food contents in your stomach to be aspirated out. The AspireAssist® allows you to remove food contents from the stomach through a tube into the toilet or sink. On average, 30% of the calories you consume are removed during an aspiration, helping you to lose weight. How does the AspireAssist® work? When we eat, food travels from the mouth into the stomach, is temporarily stored and digestion commences. It then passes into the small intestine where the calories are absorbed. The AspireAssist® is best used 20-30 minutes after eating meals and allows you to remove food contents from the stomach through a tube into the toilet or sink – this is called aspirating. On average, 30% of the calories you consume are removed during an aspiration, helping you to lose weight. If you chew your food very well, more can be aspirated leading to greater weight loss results. The tube is inserted during a 15-20 mintue procedure where you will be sedated (asleep). It will be performed in a day hospital setting so will go home the same day. You will need to have a clear fluid diet for 24 hours before the procedure and you can eat and drink normally afterwards. You may have some pain in the first 2-3 days after insertion and the doctor will give you pain relief medication to manage this. Once you heal (usually around 2 weeks after the insertion) you can start aspirating (using the tube to empty the stomach contents). A specialist nurse and team will assist you in the use of the device. During the first week of aspirating, it’s useful to eat softer foods which can be chewed well, to enable you to see what a successful aspiration is. What does a day look like with AspireAssist®? You will need to aspirate your meals around 20-30 minutes after you eat. This generally takes around 10-15 minutes and you’ll need access to a bathroom with a tap, sink and preferably a toilet. Aspirating 3 times per day (after each meal) will usually achieve the best weight loss results. It is important to chew your food very well and take your time eating – which can be a difficult habit to introduce. You will also be drinking a lot of water with your meals to help break up the food particles and allow more to be aspirated. The AspireAssist® is a tool to aid weight loss, giving you a kick-start by allowing you to control portions as you develop healthy and sustainable habits. We know the AspireAssist® is most effective when accompanied by a lifestyle program, which is why at The BMI Clinic, the AspireAssist® is paired with either our Silver, Gold or Platinum lifestyle program, delivered by a team of weight loss specialists, including Bariatric Physicians, Nurses, Dietitians, Exercise Physiologists and Behavioural Coaches. Data from our own clinic demonstrates the more a patient engages with the team, the greater their weight loss. How much weight can I expect to lose with the AspireAssist®? The more you engage with your team, the more successful your weight loss journey will be. Patients who undergo the AA experience can expect to achieve a weight loss of around 20% TBWL (Total Body Weight Loss ie. a 100kg person could expect to lose 20kg on average) over 12 months. However, ultimately, the amount of weight you lose and maintain will depend on how closely you follow the advice of your medical and allied health care team.